Well, at least that’s what I thought it meant, because amour in French means “love.” And I assumed that it was the same in Italian. (Another reason for finally getting on that life-long ambition to live in Italy and learn Italian.) But for now, checking in an Italian dictionary, I found out that “amor” means “sake.” (As in, for the purpose of.) So I’m not sure how it got its name, but this cake makes a pretty good argument for the sake of whisking polenta into a cake. I’m one of those people who is completely crazy for anything with cornmeal, from corn bread to even a kind of kooky polenta ice cream that I’m sure no one else has ever made, because I used a completely obscure polenta that very, very few people can get their hands on. But I felt compelled to make it, for the sake of using up a little bag of that polenta that I had. Fortunately, polenta is available just about anywhere. I like to buy stone-ground polenta, which has a crunchier flavor. But you could use instant polenta for this cake, normally something I avoid. But I found myself with a bag of it and was looking for ways to use it up. And here’s where the rest of it landed. Like many Italian cakes, which are unlike American cakes, this is not a buttery bomb of richness. True, there is butter and a few eggs in there. 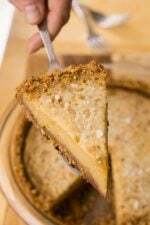 But the great flavor comes from ground almonds, which tend to make the cake much moister the following day as the nut oils soak the crumb, which is one of those baking terms (unlike amor) that pretty much seems to be what it is talking about. The polenta adds a bit of a savory quality to desserts, which draws me to use it a lot when baking. This cake is a great snacking cake and I tend to walk around my apartment several times during the day, somehow landing frequently near the cake, where a serrated knife just happens to be stationed alongside. Ready and waiting to lop a slice off. In addition to a collection of polentas, I found myself with a collection of eaux-de-vie on hand. Some were gifts, others were picked up on my travels. A few are anise-based, which pair nicely with polenta, and chocolate. I have a ginger one that is great when summer fruits are in season, like peaches, nectarines, and apricots. And the long bottle in the front right, the eau-de-vie of lees that I got in Switzerland, after I found out how good raisins in lie (eau-de-vie made from leftover grape yeast, and other stuff that falls to the bottom of wine vats post fermentation) was, after gorging on cauldrons of fondue. As astute readers can see from the fill line of the bottle, that project never came to fruition. (I’m too busy trying organize my polentas and eaux-de-vie. And plotting a way to live in both Italy, and France.) But I did add a few shots of orange liqueur (not shown), which gave it a little boost of flavor. Not enough to be perceptible. But like that bag of instant polenta I’ve had for a few months, I was always conscious that it was there. 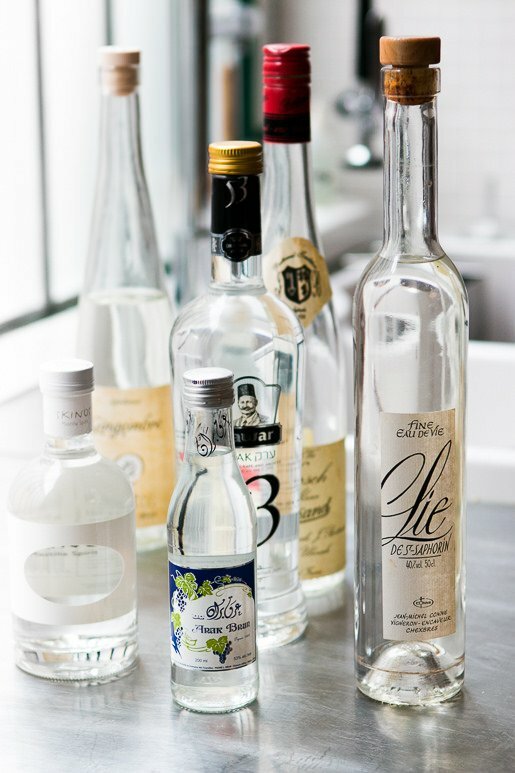 You can use any kind of liqueur that you want – maraschino, limoncello, absinthe, kirsch, or even anise liqueur. As much as I like this as a snacking cake, it can be dressed up with a fruit compote. I sectioned some tangerines, navel oranges, and pink grapefruits, drizzled a little honey over them, and served them alongside the cake. I had planned to spoon some warm sabayon over the cake and fruit, but decided that I had too many other things to do. Namely, get cracking on using some of those bottles of liqueur that I’ve been hoarding. One 9-inch (23cm) cake, about 12 servings. For this cake, using fine-ground polenta or instant polenta will result in the smoothest texture, although whatever is available will work. I’ve made it with coarse polenta too, and enjoy the crunch. Almond flour is available at specialty stores, Trader Joe’s, and online. If you can’t find it, grind 7 1/2 ounces (215 grams) sliced blanched almonds in a food processor with the flour until the almonds are pulverized.Although cakes like this don’t always need adornment, I did glaze it with a dribbly orange glaze that firms up and gives the top a citrus-scented fruity crunch. For those wanting to skip the liqueur in the cake, you can leave it out and increase the almond extract to 1 1/4 teaspoon. For the glaze, you replace the liqueur with orange juice. 1. Butter a 9-inch (23cm) loaf pan. Dust the inside with polenta, and tap out any excess. (Note: The pan I used has a nonstick finish. 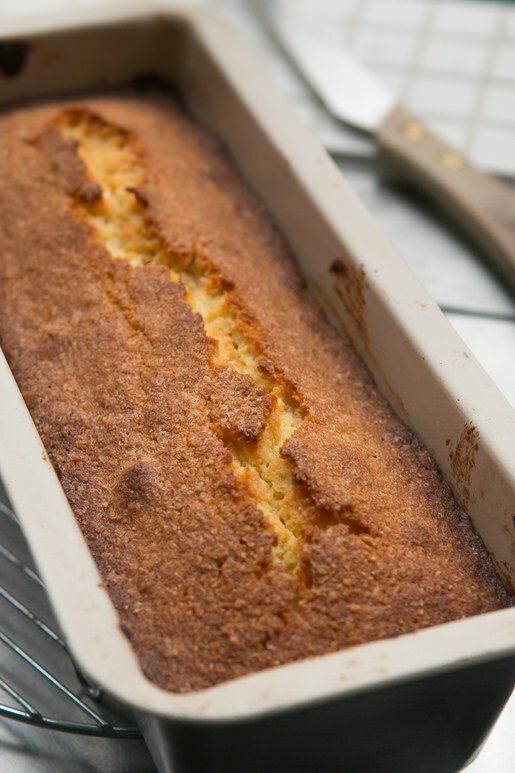 If you want to make sure the cake comes out nicely you may want to cut a rectangle of parchment paper and fit it into the bottom of the pan after you prepare it, especially if using an unfinished loaf pan.) Preheat the oven to 350ºF (180ºC). 3. Add the eggs one at a time, stopping the mixer after each addition to scrape down the sides of the bowl. Mix in the liqueur and almond extract. 4. In a medium bowl, whisk together the polenta, ground almonds, flour, baking powder, and salt, until there are no lumps. Gradually mix the dry ingredients into the creamed butter mixture, just until well-combined. Do not overmix. 5. Scrape the batter into the pan, smooth the top, and bake the cake until it is golden brown on top and a toothpick inserted into the center comes out almost clean, perhaps with just a few crumbs attached, 45 to 50 minutes. Let cool on a rack for about 30 minutes, then run a knife along the outside of the cake to loosen it from the pan and tip the cake onto the rack. Let the cake cool completely before icing. 6. 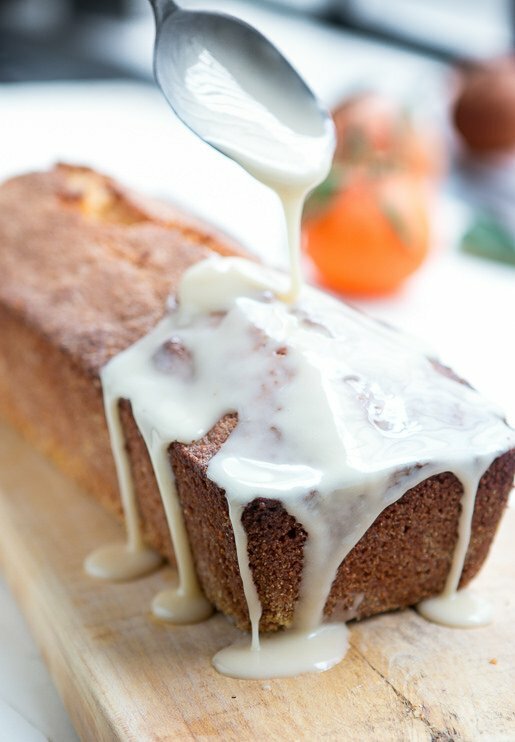 To glaze the cake, mix the powdered sugar with the orange juice and orange liqueur until the glaze is thick, but still runny – not too watery, but as thick as a milkshake. If necessary, add a bit more sugar if it’s too thin, or add a bit more liquid if it’s too thick. You can try smoothing a bit over the cake to see if it’s the right consistency for drizzling and dripping down the sides before glazing the entire cake. 7. Spoon the glaze over the cake, encouraging the glaze to run down the sides by nudging it towards the edges with the back of the spoon or a metal spatula. Serving: When the glaze has firmed up, serve slices of the cake with a favorite fruit compote, such as fresh citrus segments, caramelized pineapple, poached pears, or sliced and sugared peach slices (peeled) or nectarines. Storage: The cake will keep for up to five days, if well wrapped, at room temperature. The cake will be noticeably moister the day after baking due to the oil in the nuts. It can be frozen for up to two months. This looks like cake heaven! I am not Italian, but I live in Italy, and some consider this cake to be the best Italian tea cake. It is also called “Dolce Varese”, because of it’s origins (Lombardia). Most important ingredient of the cake is corn flour finely milled -called “Fioretto” (not the coarse one used to make polenta). Nigella Lawson has a similar version that I’ve made for years, which uses only lemon juice, no liqueur, in the cake. The cake then gets completely soaked in a lemon syrup after baking. It’s deliciously tart and eggy. I love the idea of an orange version served with citrus sections. I also enjoy a less sweet dessert, which often becomes breakfast in this house! I want a piece, please! This cake is heavenly! I just posted a version of lemon pudding with polenta because I love it so much. Thanks for the recipe, I shall try it soon! Great recipe, David. I live in the southern United States and will be using regular cornmeal. Does it matter if it’s white or yellow? Or, just a matter of preference? Probably you found that amor means “sake” because we use more frequently the shortened version to say “per amor di Dio” that means “for God’s sake” and other similar expressions (this is an example). I hope this was useful for you! Btw, I made your duck legs with prunes for the New Year’s eve and they turned out spectacular! The only different thing I’d recommend is to take out all the braising liquids, strain them, maybe add just a tiny little bit of starch and reduce them on high heat and serve the meat with the sauce. I actually seasoned a big bowl of linguine with this sauce and it was beautiful! I’m up-there with you, I love corn-anything. I grew up (in Puerto Rico) with corn cakes and corn porridge similar to polenta so I always find it comforting to eat (or read) about these dishes. By the way, I started following your blog after I read your post on corn cakes. United by the corn! Vildana: I love using corn flour (which is not what people in the UK refer to as corn starch, in the US) but that finely milled corn flour. I think it’s hard to get in the U.S. so I use fine polenta, or instant, but corn flour is a terrific ingredient to use in baking. Jude: To be honest, I’ve never used white cornmeal so I don’t know. But I would imagine it behaves exactly the same, although the color of the cake of course will be different. Duclistella: Thanks! I figured it meant “love” but was surprised when that definition didn’t turn up. (But I was so busy editing photos, writing the recipe and a story and, of course, eating cake, so I didn’t research it as deeply as I wanted to. Otherwise, the post would never have gone up!) Really glad you like the duck with prunes recipe. Angel: Yes, cornmeal is something that’s loved the world around, from Mexico to Italy, Puerto Rico…and Paris! On the gulf coast of the States you can buy a yellow corn flour, like a finer milled cornmeal, made by Zatarain’s of Louisiana. It is used primarily for breading catfish before frying but could be used to impart some crunch when baking. Your last comment, David, about the nuts’ making the bread more moist as it sat until the next day, finally explains why my late Grandmother insisted that her (brilliant) nut bread (made with chopped walnuts) should be kept for a day before slicing. For anyone in the Atlanta area, finely ground Nebraska yellow corn flour available at the DeKalb Farmers Market. This cake sounds wonderful. Despite the fact I live in north of Italy, where polenta is a must eat, one of the most typical dishes, I must confess I don’t like it so much. But this cake looks so good and the taste seems so delucious that I think I finally found a good alternative for polenta flour!! This looks delicious. Have some almond flour in the freezer. Will be making a loaf this weekend. Thank you David! Can’t wait to try this – your recipes are always winners, and I love that you have so many that work perfectly for us celiacs! I’ve not made it without the flour but suspect it could be modified, but that’s not really my area of specialty. I would think about corn flour, which is very finely milled corn, or a gluten-free flour blend that you like. I know gluten-free bakers use xanthan gum but I’ve only used it once or twice so don’t have a lot of experience. If you do try one of those options, please report back! I am cleaning out my pantry and trying to use up everything before restocking. I have been making a lot of things I don’t usually make trying to use up dried beans, various flours that I bought for a recipe, jars of things that seemed like a good idea while I was shopping, etc. Anyway, the point is, I have some polenta and it looks like the perfect amount to make this cake. Problem solved!! Now I just have to come up with something for the beluga lentils and chick pea flour . I will search your archives! This is a cake to fall in love with:-) I make a similar dessert only with semolina flour. I believe semolina flour is more of a durum wheat. 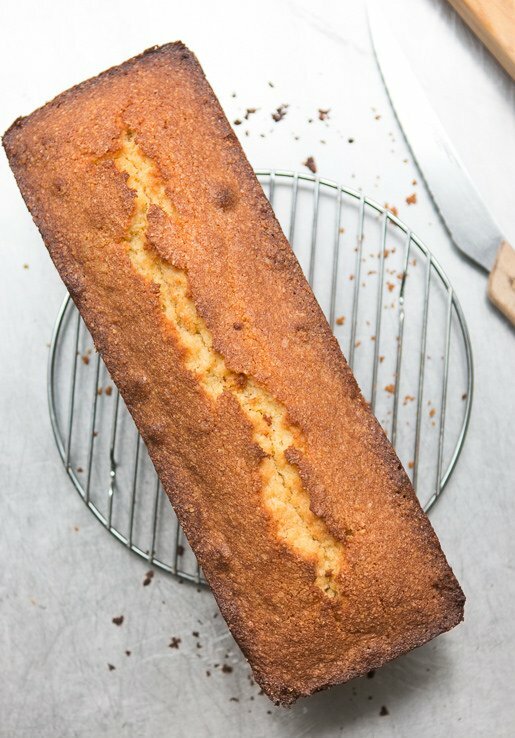 But do you think I can substitute polenta for course semolina in this cake recipe? I so enjoy your recipes, and I have often meant to write with one question, about flour. 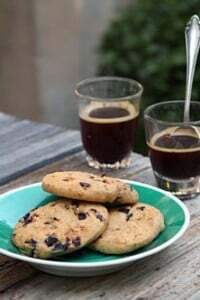 When you post these recipes, are you giving the measurements based on French flour, or have you altered for say, North American flour? I ask this because when I lived in Stockholm a few years I quickly found that my Canadian baking recipes did not turn out well. I wrote to the wonderful Allt om Mat magazine and they published my question (complete with adorable, if not stereotypical, cartoon of a blonde home baker with a grizzly outside the kitchen window!!). :) I found out that Canadian flour is much more protein-rich than Swedish, and I’m going to guess that’s the same with other European flours? I have to adjust my Swedish recipes by almost 1/3 flour to make them work! Any thoughts? Merci! Great. I was just about to make a banana cream pie and now I’m going to check my freezer for almonds. There are nut allergies in the family, while vanilla extract can be changed for almond extract, what about the almond flour? How can the recipe be adapted for nut allergies? What can I substitute for almond flour? Would gram flour work? OK–back to the exclusive (Italian) polenta for a minute, because I am also one of those “anything with cornmeal” people. As a kid, my grampa used to make cornmeal mush for us, which I still love to make. I think I finally perfected it, because my daughter recently approved it despite its name. Is this cornmeal possibly related to the 8-row Flint discussed by Dan Barber in his book “The Third Plate”? According to his story, this corn was originally native to North America centuries ago, made its way to Italy, is no longer common here but is hopefully being revived. Thanks so much, David! I’ll probably make it tomorrow and will skip the gums since the amount of flour isn’t high (which makes me think the gluten in the flour isn’t essential). If it falls apart, I’ll know to use a gum the next time! And I’ll report back on the results. That doesn’t look like the standard loaf pan we use here in the U.S. Does it make a difference? Oh, this sounds delightful. A perfectly acceptable breakfast, if you ask me. 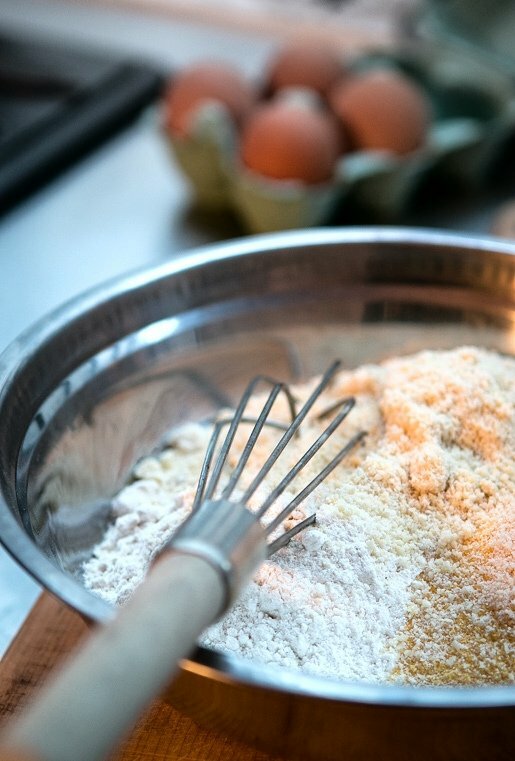 Have you been able to find aluminum-free baking powder in France? I have a real dislike for that tinny flavor I can taste in my muffins and scones but haven’t been able to find a solution here in France. I bring back aluminum-free baking powder from the states because I don’t like the metallic taste of regular baking powder either. In Paris, La Grande Épicerie often carries Rumford baking powder (which is aluminum-free) as well. I just took an “Orange and Bourbon Cake” from Lisa Yockelson’s book out of the oven. The citrus and booze vibe must be in the air. The recipe makes extra glaze, which I may just drink if I don’t get a hold on myself. Why cant I email your recipes to my friend? There’s no little email icon. I want one. Please? oh wow this looks so good! 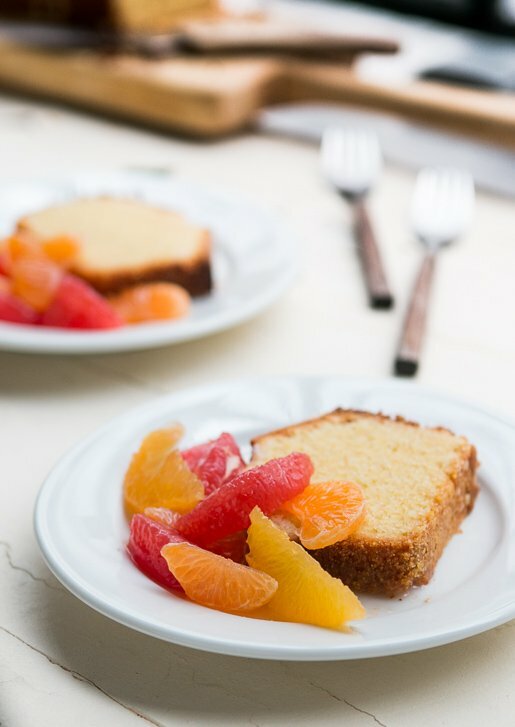 I’m always looking for new citrus recipes during this time of the year, I can’t wait to make this! I’ve played around with cornmeal/polenta tea cakes for a few years and found the best (for me) texture is using a 50/50 mix of coarse and fine polenta. But I think the almond flour addition is genius, and look forward using corn flour. To echo a previous comment, now I know why my grandmother insisted on not serving us her walnut cake until it was a day old. “…like that bag of instant polenta I’ve had for a few months, I was always conscious that it was there.” Thank you! I don’t understand how my husband can’t notice what’s always right in front of him in the pantry and the fridge, and he can’t understand how I always seem to know what and where something is, even if we haven’t used it in six months. 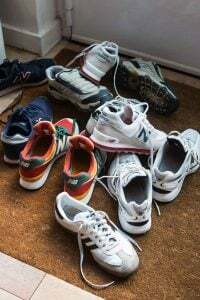 I’m so glad I’m not the only one who walks around constantly with a kitchen inventory in their head. Trader Joe’s doesn’t have dry polenta, but rather a wet, ready to use form….same with Sprouts. Would it be possible to use that and then do the powdering with cornmeal? I’ll be making this…looks excellent…yum! To Wendy: Usually natural foods stores like Naturalia stock aluminum-free baking powder. I hate that taste, too! Hmmm nice, I am a fan of such sturdier cakes. But David, the concept of a snack cake sounds very American to me, eh? I somehow cannot see any European going back and forth for another piece of cake without having a guilty concience. Great recipe, and would love to bake it. I live in Inland Andalucía, Spain and have been trying to find Polenta here. Cornmeal translates as Harina de Maiz but it is corn starch! Do you know, or can you ask any of your Spanish friends, what Polenta is called in Spanish? 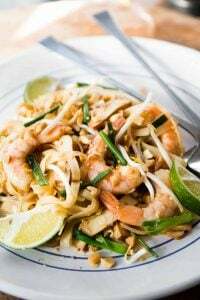 Will be making this today. Here in Pennsylvania we are lucky to have a local mill (Castle Valley) that makes wonderful corn meal. The tail end of a bag will be just enough for this cake. Regarding baking powder – several years ago I read the book The Gift Of Southern Cooking by Edna Lewis and Scott Peacock. They recommend making baking powder and it’s so easy. 1/4 cup cream of tartar and two tablespoons baking soda. Sift together three times and store in an airtight container. Thank you, David for all the wonderful recipes! It’s a snowy Saturday here in New England. When it snows I get the urge to bake. I had all the ingredients on hand, and just slid one in the oven. Can’t wait…it’ll go nicely with a cup of tea later this afternoon. Thanks, David…good idea! I made this immediately – it was just what we needed on this cold snowy night. Thanks David, for always having something delicious to make for every occasion. …Even if it’s just a cold snowy night at home. Hi David, here’s the gluten-free update: I used a premix (Cloud 9) which does have a bit of xanthan gum. The cake rose beautifully and smells great – it’s now cooling on the counter, and it will take a lot of self-discipline to not dig in before getting it to the dinner party I’m going to tonight, tasked with bringing dessert! To Issi in Andalucía: “polenta” is also used in Spanish, but if you can’t find it under that name, try looking for “sémola de maíz” or “maicena” – and, you could also try asking for “harina de maíz gruesa”. As a follow-up to my original post, this cake is outstanding. The only problem, and it’s a serious one, is that there is NO way it’s gonna last into that second day…. I made this for a dinner party tonight, and it’s terrific. I love a dessert that’s not too sweet – and that glaze is delicious on the cake. Thank you, I’m a new convert to polenta cakes!! Thanks for the recipe. I absolutely love anything with cornmeal! What are your thoughts on baking this in a tube or bundt pan? Amor Polenta was the very first cake I served to Domenico when we were first going out. And I think it did make him amor me all the more. Where did you find the reference that amor meant ‘for the sake of?” Was it part of the phrase ‘per amor di dio’? Which sometimes translates as ‘for god’s sake’, but which literrally means ‘for the love of god’. It’s morning in America. And I have a polenta cake. Snow day here in Boston = made this cake. It tastes amazing. 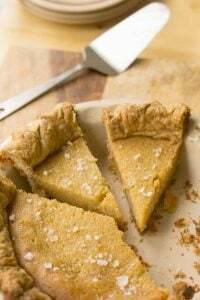 Love the cornmeal texture and buttery cake infused with lemon. Thanks for posting this one. I baked this wonderful cake today. It’s just like yours, but the glaze is blue: the only orange liqueur I had at home was blue curaçao. Thanks for sharing the recipe. I live in Portugal. OMG does my kitchen smell good right now! I zested the orange, too, and added that to the glaze. Try adding fresh chopped rosemary. It takes the cake to a whole new level. I call it my “Adult” Polenta Cake. Your photographs always inspire, so I finally caved and got a dslr! Can’t wait to start shooting. Love the length of that pan. Polenta is one of my favorite things to bake and cook with, favorite recipe of all time is the rosemary olive oil polenta cake from your book (it’s also savory enough to serve with soup, among other things). to Issi, in Andalucia: I live in a small town in Portugal near Badajoz, so I usually buy my polenta in Spain. Italian and French brands are usually available in Carrefour, El Corte Inglés or Hipercor. Thank you Fernando, I have a Carrafour here but couldn’t find it they only had Harina de Maiz which is corn starch. there is El Corte Ingles nearby in Jaen, do you know what it is called in Carrafour? or the name for it Spanish? Or is it just called Polenta? No one seems to know what am talking about when I ask for I!! Thank you for your reply. thank you for the recipe! Although not a fan of traditional corn-based deserts, this cake is surely to become one of my favorites. I think adding Cointreau and lemon zest were just the right things to do, and the glaze truly gave it a nice finish. I adjusted the baking time a bit. The only issue that I had was that the cake did crack in the middle. What did I do wrong? I used cornmeal because it was handy and I wanted to experiment. Agree with David, the color was different but not in a bad way. The taste was great. So all in all, safe to substitute. Thank you and cheers to many more recipes. I have made several versions of Amor Polenta for my gluten-intolerant daughter (there are several gf recipes for it online. )I always found it a bit dry, but my family loves it. Of course, I only indulge in a small taste of the freshly-baked cake, while they continue eating it for days. Your comment about the nuts needing a day to moisten the cake makes perfect sense of this problem…next time, no tasting until the next day! I have made it with medium stone-ground white corn meal, as that is what I use for corn bread, and so I have it on hand. I’ll try the instant polenta mix for this one. 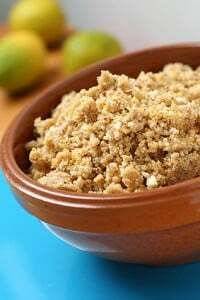 A quick question / comment regarding the ground almonds: At least in Scandinavia and in Germany ground almonds and almond flour are two quite different things. The almond flour has some (most) of the oils removed, so it ends up quite a bit dryer. On the other hand, I have not yet been able to find ground almonds in Norway, so I might give it a try. This will likely result in a (much?) dryer cake, won’t it? to Issi, en España: I don’t know any word in Spanish or Portuguese for polenta. In Portugal it’s not popular at all but in Brazil it’s common and they just call it polenta, too. In Carrefour in Badajoz I think it’s near the other harinas. Sometimes it’s near the pasta section. En el supermercado de El Corte Inglès I’m sure you can find italian brands of polenta. Check El Club del Gourmet, too. Saludos desde Portugal. Made this last weekend. It was outstanding!!!! 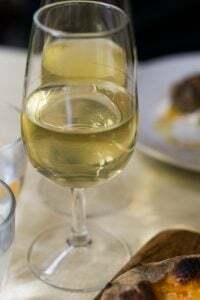 Served it with citrus fruit which paired exceptionally well (particularly grapefruit). Doubled the recipe and made it in a bundt pan. I have been thinking about this cake for days. I finally made it today. It came out beautiful. I purchased instant polenta to get the same crumb as the loaf pictured. It is a joy. Maybe next time I will have to double the recipe and share one and have one just for family. I have been telling everyone about this beautiful cake and I feel that I will have to share at more than half so other can see its beauty and flavor. Please provide more info on the baking dish used and how to print the recipe with the photos! I made this cake over the weekend for a dinner party and it is unbelievable. I served it with macerated strawberries and sabayon (as you suggested) and my guests ate the whole thing … no left overs for breakfast. This is a keeper! Just what I need on a gray winter’s day here in SoCal: a gorgeous photo of citrus fruit and corn cake, all bright pastels and gold. Thank you for your eye and skill as photographer, David Lebovitz. Just made this as a half recipe in a 7×3″ loaf pan. Made without liqueur, just lots of lemon juice. Seems like one of those old dependable recipes. Thanks!! This was so delicious that it doesn’t need the frosting. Can I sub olive oil for butter in this cake? If yes, how much oil? 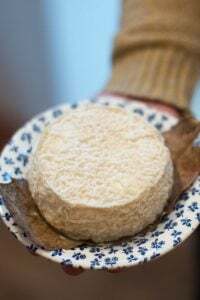 Where do you buy almond flour/almond extract in Paris? At a Monoprix? Also, I assume that standard Italian industrial polenta will work for this recipe, but where do you get your special polenta when you’re here? thanks! Looking forward to trying this recipe; I think I’ll use limoncello and lemon juice because that’s what I have on hand. Thank you for this recipe. 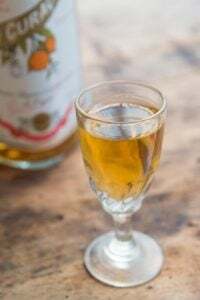 I tried it with a few modifications: no liqueur (subbed by orange juice; simply did not have any liqueur at home that would suit), orange zest instead of lemon, and no almond extract (not something I appreciate anyway). It was so good! We just finished the last piece. It did stay very good up to five days well wrapped. My cake was however not baking well after 1h in the oven; I took it out anyway but it was still a bit underbaked in the middle. It could have been a difference in flours used, or the ovens. Nevertheless, we enjoyed the texture and the flavour – this will be baked again in the future! I made this. It’s amazing. It made the house smell amazing. The texture is crunchy. It is EVERYTHING. I may make another loaf tomorrow, because my first go at this cake was made for a dinner party. 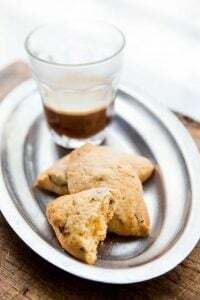 @David: your recipes are rock solid, and I’ve made the with great results before (like your baci di dana cookies)–but this one is so easy and straightforward and yet with an amazing outcome. I made this and my man declared it the best thing I´ve ever made. You´re the best David! I too adapted this cake to be gluten-free. I used an equal amount of Bob’s red mill all-purpose gf flour (which does not have any gums) and the cake held together fine. It’s very moist — and very, very delicious. I made two loaves yesterday (one to bring to family sitting shiva, another to a dinner party) and am about to bake a 3rd as a thank you gift. Thanks for this lovely recipe, David!